A new space, Diamond Villa has much to offer those on holiday including intense seclusion, beautiful views, and spacious accommodations. Take this opportunity to refine your culinary savvy in the well-furnished kitchen, then serve the two of you or all of your guests in the outdoor dining room overlooking the solar heated pool. You could also take advantage of the central location of Diamond Villa and head into St. Barth’s for some fantastic shopping or a chance to dine at phenomenal restaurant options like Eden Rock. You could even spend the day watching boats and wind surfers from the enormous windows in the main living area. Any way you look at this villa, it spells the perfect holiday. Diamond Villa welcomes its guests into a world of thoughtful and stylish design. Built in 2012, this property benefits from the informed experience of an owner who knows exactly what visitors to St. Barth need. 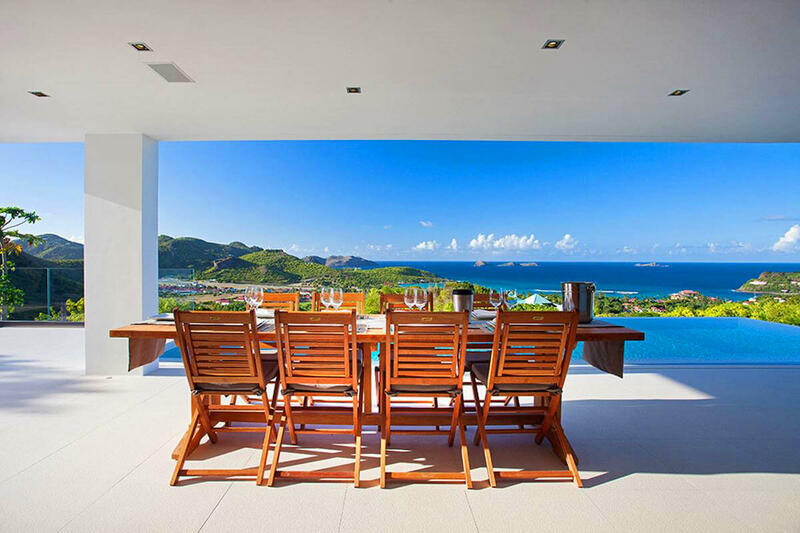 On a hillside overlooking the bay of St. Jean, this home offers an iconic St. Barth ocean view along with the convenience of being only a short drive to town or to any number of the island’s most beautiful beaches. Diamond Villas main living area centers around the open-plan kitchen, making meal preparation pleasingly social and efficient. Vast sliding glass doors hide away to open the entire space to the terrace and solar-heated infinity pool. On one side, the living room offers white leather sofas and a home-theater system incorporating all the latest technology, from a DVR loaded with films-on-demand to surround-sound audio by Denon and KEF. Just outside, the sheltered dining table provides seating for up to ten, and rattan seating for six makes the perfect spot for a late afternoon in the shade with a good book. Chaises on the teak deck beside the pool invite you to bask in the sun in between dips in the pool. To either side of the main living area are Diamond Villas two bedroom suites, with hardwood floors, generous closets, and marvelous views. Each one boasts its own ensuite bath with Grohe fixtures and rain-head showers. Diamond Villa is the answer for guests seeking a place created with their requirements in mind and graced with aesthetic touches that make it the epitome of modern island elegance. Welcome- 10 years and older, please. No babies.